In discussing the pace of tech news this week, the phrase “shock and awe” came up and it stuck with me. Maybe it’s an insensitive metaphor to compare Google’s announcements this week at its Cloud Next 2019 conference to a U.S. military action meant to intimidate the opposition into submission, but it can feel a bit like an assault on the ol’ attention span and a barrage on the ability to keep pace when this many announcements come at once. GCP Gets Data-Service Integrations: First up, Google announced that it is bringing in the best of open source to Google Cloud customers, with seven partnerships in the realm of data management and analytics, including Confluent, DataStax, Elastic, InfluxData, MongoDB, Neo4j, and Redis Labs. With these partnerships, Google will offer tightly integrated managed services into Google Cloud Platform (GCP), providing a single user interface and unified billing, as well as support. In a separate but similar announcement, Google also announced three new enterprise databases: a sneak preview of Cloud SQL for Microsoft SQL Server, CloudSQL for PostgreSQL with version 11 support, and multiregion replication for Cloud Bigtable. I’ve just tried the first #CloudRun deployment. There’s nothing to test , you just need to build your Docker image, push it to the Google Container Registry and run it. Well done! Google Cloud Run: Now, we start to get to the meat of the week’s announcements, with Cloud Run, the newest member of Google’s serverless compute stack, which it says is meant to provide “the ease and velocity that comes with serverless or the flexibility and portability that comes with containers.” Cloud Run is in beta and lets developers focus on writing code without worrying about the underlying infrastructure. 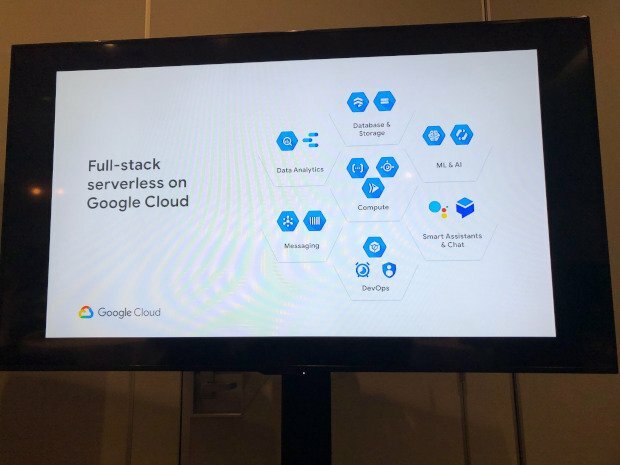 Based on Knative, an Open API and runtime environment that lets you run your serverless workloads anywhere you choose, Cloud Run “serverless workloads anywhere you choose” and “takes care of all infrastructure management including provisioning, configuring, scaling, and managing servers.” Cloud Run is available fully managed on GCP, on your GKE cluster, or your on-prem Kubernetes, and movable between. In addition, Google also announced new investments in Cloud Functions and second-generation runtimes in App Engine, including new language runtimes support such as Node.js 8, Python 3.7, and Go 1.11 in general availability, Node.js 10 in beta; Java 8 and Go 1.12 in alpha. And Of Course… The Artificial Intelligence and Machine Learning: What would any good slew of announcements be these days without the prerequisite AI and ML news? While some of the new tools are meant specifically for the business at large, Google writes that it is expanding its platform to make it easier for developers to build and deploy AI. The first of those announcements is the beta release of AI Platform, a “comprehensive, end-to-end development platform that helps teams prepare, build, run, and manage ML projects via the same shared interface” with model sharing, training, and workload scaling all managed from Cloud Console — and of course, like the other tools, it is meant to work in a hybrid environment, not just in the public cloud. Google also announced some updates to Cloud AutoML, including AutoML Tables, AutoML Vision, and AutoML Video to make it easier for businesses to build and deploy their own custom ML models. Journalist writing about coders: "To the untrained eye, the code is just a jumbled mess of letters, numbers and symbols. But to a coder, each line is clear. She knows and understands every digit and dot in the same way a pianist would read a page of musical notes." Feature image from Alex Williams. The post This Week in Programming: Google Cloud’s Shock and Awe Campaign appeared first on The New Stack.